DS has written to the House of Commons Defence Committee about its concerns with MOD plans for UK Intelligence, Surveillance, Target-Acquisition and Reconnaissance enabled weapons platforms and interconnectivity for Data Linked Communication transfer following SDSR 2015. Of particular concern has been the disconnect between SDSR 2015 plans and the lack of additional funding to meet them. Thus leading to the cancellation, reduction or curtailing of some projects to fund others. 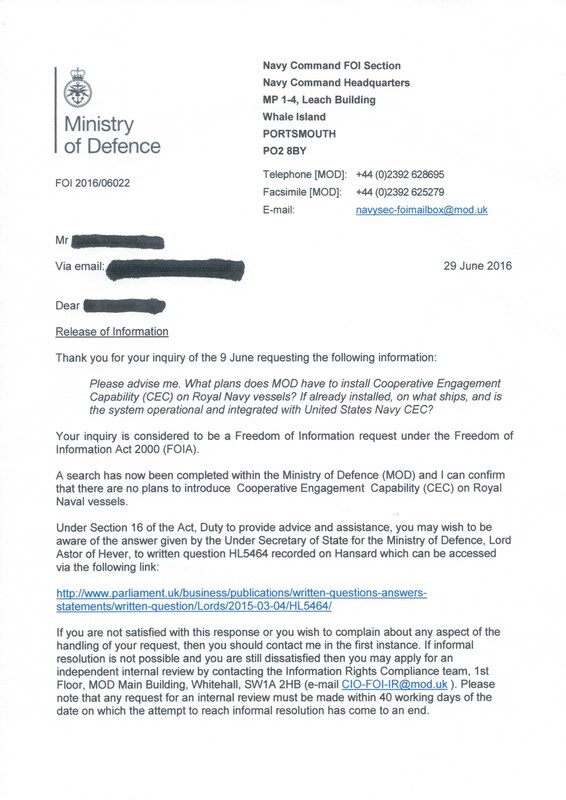 Although cancelled some time ago, DS is most concerned that MOD UK (Navy) have no plans to install Cooperative Engagement Capability (CEC) as a recent Navy Secretariat reply to an FOI request confirms. See FOI reply here. Since 2010 DS has submitted papers to the House of Commons Defence Select Committee (HCDC) extolling the virtues of ISTAR systems as force-multipliers, most especially in times of severely reduced weapons platform numbers. DS has strongly advised the HCDC of the necessity of pressing MOD to fund, introduce and maintain ISTAR systems that are essential in the modern era to enable effective ‘Battle Space Management’ at an affordable cost. Principal air-systems such as the F35 Lightning II, Typhoon, E3-D Airborne Warning and Control System (AWACS) Sentry, R1 RC135 Rivet Joint Air Seeker, R1 Airborne STand-off Radar (ASTOR) Sentinel, P8 Poseidon Long Rang Maritime Patrol Aircraft (LRMPA) and unmanned systems, being brought into service quite rapidly, have all featured as areas of concern. and across all 3 UK services have the ability to network with cooperating air, land, sea platforms and to share Command and Control (C2) and intelligence gathering with national and mobile Headquarters (HQ). 2. Whilst MOD has acknowledged in Strategic Defence and Security Review (SDSR) 2015 the requirement for ISTAR to enhance its ‘Whole Force Concept’ model it is less clear that the funding to achieve this has been made available. For Example, although SDSR 2015 promised an upgrade to the data/communication system on the E3-D Sentry – what the US and allies refer to as Block 40/45 – the latest information from MOD UK (Air) is that the aircraft will have a flight systems update but, through lack of funds, the upgrade to the communication and data collection system has been suspended. What this means in practice is that Royal Air Force (RAF) AWACS will continue to fly into the 2030’s but slowly the RAF E3-D fleet will begin to experience reduced data integrity as interoperability becomes less assured and eventually compromised in relation to upgraded allied AWACS aircraft. Furthermore, the utility of RAF E3-D will therefore diminish over time.1 Finally on the subject of RAF AWACS capability. It is worth noting that the original contract with Boeing was for seven E3-D. This fleet is now reported as six maintained in operational flying condition, with the seventh airframe, which was damaged in a ground accident, being used in a ground training role. The RN surface fleet of frigates (FF) and destroyers (DD) is being reduced to eight Type 26 FF and six Type 45 DD with possibly five further FF of lesser capability (sometimes referred to as the Type 31). An escorting FF/DD may sit 30 miles ahead of the task force and an F35B 200 miles to its rear but their radar coverage is still limited by physics and, without data connectivity with the Flag ship, the picture they see is stand alone. However, in its simplest form, CEC significantly enhances a task force commander’s threat picture in his ‘battle space’ by integrating the data from, and with, all CEC enabled ships and aircraft in the force, thereby offering all such equipped platforms a much wider area of surveillance, early reaction and action. A force multiplier for fewer ships and aircraft and a major supposed basis for the structure of our joint force. 4. When DS examined the reality of SDSR 2015 and subsequent announcements, what we found was that for every proposed capability enhancement there appeared to be a corresponding reduction in capability elsewhere in the order of battle (ORBAT). For example, the introduction of the P8 Poseidon LRMPA, which is welcome, has been met by MOD UK (Air) with a commensurate reduction in ISTAR capability. The future of R1 ASTOR equipped Sentinel fleet is once again under threat and, in the interim, the crewing ratio has been halved – possibly to help the RAF with a plan to increase the crewing ratio for E3-D Sentry. The old saying ‘robbing Peter to pay Paul’ has significant resonance in military circles where it is common knowledge that the enhancements announced in SDSR 2015 are largely unfunded. 5. DS has followed the ‘ISTAR’ debate over several years and concluded that Her Majesty’s Government and MOD are playing fast and loose with the fundamental truths. On the one hand HMG/MOD have used the advent of ‘ISTAR force multipliers’ as justification for reducing weapons platform numbers (ie to save cash) but on the other reneged when spending was required to enhance true ISTAR capability. Reducing major systems numbers on the promise of greater ISTAR and connectivity, then not providing that ISTAR and connectivity is militarily irresponsible and disingenuous to our servicemen and our allies. Such an approach is a lose lose situation that will have extremely serious consequences for UK Forces in future operations. 6. The SDSR 2015 commitment to upgrade RAF E3-D Sentry to US/NATO ‘Project Eagle’ Block 40/45 standard for secure data/communications transfer was short lived and now appears to have been shelved. Ahead of SDSR 2010, a decision quietly taken, HMG/MOD decided to cancel CEC for the RN despite being wedded to the purchase of F35B which is predicated upon it and, earlier, justifying the decision to buy only six Type 45 DD based on the force multiplier effect of CEC. Now we learn that the R1 Sentinel ASTOR capability – an Army requirement – may well be retired early by the RAF possibly to fund other projects promised in SDSR 2015 – ie based on Hansard, 27 June 2016, nine P8 Poseidon not yet contracted for and, albeit not mentioned earlier in this paper, the two badly needed additional Typhoon squadrons detailed in SDSR 2015. 7. It is the considered recommendation of DS that the HCDC investigate the full impact that the changes and modifications to ISTAR capability are having upon the operational effectiveness of all three services within the context SDSR 2015. 1. The Project Eagle Block 40/45 upgrade gives an Open Systems Architecture (OSA) by replacing the entire computing architecture and much else besides. In very simple terms, a plug and play architecture like a home PC, where peripherals can be added with little difficulty. As 40/45 takes hold and the other sub-fleets move on, the RAF E-3D will not be able to keep pace with software changes, and that’s where the problem arises. The loss will start slowly (probably but not certainly) and become more and more rapid. 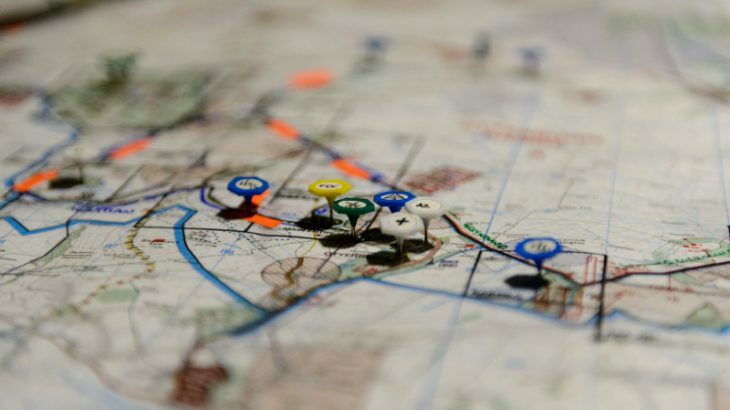 The risk is that interoperability will become so compromised that RAF aircraft on multi-national operations are liable to cause confusion in allied battle management centres and, therefore, be excluded.